If you follow me on Instagram, you may have noticed I took a little trip to Florence, Italy recently! One of my best friends was studying in Florence as part of her year abroad for uni, so it was a great excuse to see the city and catch up with her. We stayed towards the south of the city, which was about a 10-15 minute walk into the centre. The great thing about Florence is that everything is within walking distance, taking good walking shoes is ideal as most popular viewing areas do require steps but are well worth the exercise! I basically followed the DK Eyewitness Top 10 Travel Guide to Florence and Tuscany, which had a mini map and all the information you'll need for visiting places, times, entrance fees etc. So if you're looking for a mini city break (I'd probably recommend 4-5 days for Florence) keep reading for my top places to visit. This is Florence's most famous sightseeing spot, with a gorgeous cathedral, baptistery, bell tower, dome and museum. Tickets were around 15 euros for all 5 attractions and can be used over 2 days, which is great to spread them out! You can climb up both the bell tower and dome, we did both on separate days but the queues for the dome can be massive, however with the tickets you can book a time slot to go up the duomo and skip the queues. The views were absolutely stunning and so typically italian that you're just left in awe. The cathedral itself is impressive too with it's intricate fresco and exterior design, just remember to wear something to cover your shoulders and legs when visiting otherwise they won't let you in. The museum is also good and perfect if it's a rainy day, which houses amazing architecture and a Michelangelo piece too. Save these two for a sunny and clear day, as the views across Florence are so stunning (and the perfect Instagram opportunity!) Piazzale Michelangelo is the most touristy spot for a panoramic view of Florence and it is great for getting photos, but our favourite was Forte di Belvedere - Kim Kardashian and Kayne West got married there FYI. This view was much more central and quieter to get photos of than Piazzale Michelangelo, at one point it was just us and a guard! 100% recommend going here. Florence is also well known for its architecture, something which hasn't changed for many years. The above photos are just a few highlights which I would recommend. First is Piazza della Signoria that is described as an outdoor sculpture gallery, with pretty cool designs and a fake David by Michelangelo (the real one is housed in a museum in Florence). The town council is just off the square, as well as the popular Uffizi museum and gallery which you'd need to book tickets for! We visited a few of Florence's churches, which follow the same exterior designs as the duomo and are still very impressive in real life as they were hundreds of years ago. We didn't manage to get inside the Santa Croce church as we were running out of time, but it's been dubbed the "Westminster Abbey" of Florence with tombs of famous Tuscan figures. The Ponte Vecchio is another must-see bridge, which both sides hanging over housing silver and goldsmiths since the 16th century. Definitely visit at night too. Eating food was probably the second most exciting thing on my list for visiting Italy. Luckily my friend had already spent 4 months in Florence, so knew all the good places to eat! We had white chocolate and meringue gelato from Edoardo and sweet salted caramel from Gelateria dei Neri and for fresh pasta and pizza, there's tons of places to visit. The food market off from San Lorenzo is a must-eat too, including this delicious pizza. For souvenir shopping, you'll always find italian leather bags everywhere, and at reasonable-ish prices too (we bartered for a few of ours!) The supermarkets were pretty well stocked which italian chocolate, honey, olive oil and everything else for souvenirs! 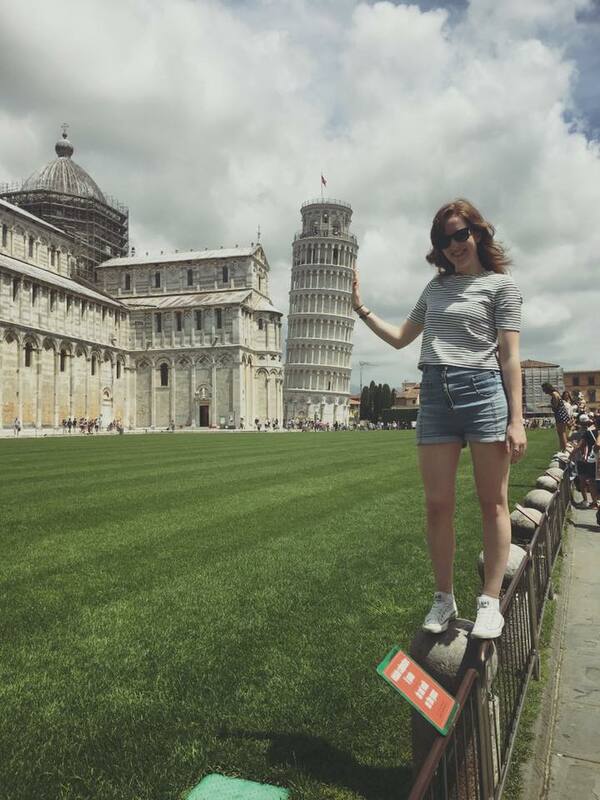 Holding the Leaning Tower Of Pisa up! The famous Italian landmark is just an hour out of Florence on their high speed trains and cost around 16 euros for a return ticket. Besides the Leaning Tower and other buildings around it, there's not much else in Pisa. We spent about 5 hours or so in Pisa, once we got there we headed to get our tickets and booked to walk up the tower. They only allow a certain number of people up the tower every 30 minutes so you have to book a time to walk up there. After getting the standard leaning tower poses, we grabbed a panini and sat on the grass before we walked up the tower. The views weren't as great as they are in Florence, but still worth the experience and weird gravity pull as the tower leaned on way and other. There's a few shops on the way to the station, which can kill an hour or two before heading back to Florence. Overall, if you're looking for a city break with lots of visit, see and eat, I'd 100% recommend Florence. It's less crazy busy than Rome or Milan but still has enough to keep you entertained and Instagram feed flowing with new pictures! Have you visited Florence before? What's your next holiday trip? P.S. Thanks to Kamila for letting me stay and for taking all the photos, and to Emily for being a fab travelling partner!